These things crack me up. Remember way back when in the archives of the JSFR when we did Calorie Mate? 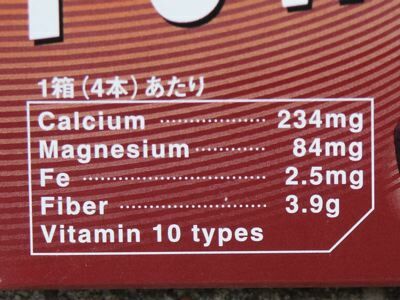 I suspect that these are Healthy Club’s (or Hamada…I’m not entirely sure who the parent company is here) answer to Calorie Mate. The Japanese version of a PowerBar if you will. I found three flavors (thus the extra JSFR this weekend) of Balance Power and two of them are NEW! flavored so I thought I might as well start with the old standby flavor. You know, the basic hum drum flavor of cocoa. Heh. You gotta give points to a company who starts off with something chocolaty as a base flavor. They certainly are very cocoa-y looking and they smell like chocolate Pop Tarts. Well they do! I kinda like the smell of chocolate Pop Tarts so I’m good with that. They even have little chocolate chips imbedded in the bar, which is cool. I missed that when I was photographing, otherwise I’d have a close up of the itty bitty chocolate chips so you can see them. Apparently my bar model was either lacking in the chips or presented a chipless side for the camera. Hmmm! As far as taste, these too are going to need sauce if they are the food of the future. Perhaps not as much sauce but there is a dusty pastiness that a bit of Hershey’s syrup might help. I bet they would go really well with some chocolate chocolate chip ice cream. They are indeed cocoa though. Mmmm. And much tastier than chocolate Pop Tarts, which are also a bit dry even with the filling. Filling! Balance Power cocoa would absolutely gain at least an extra half pea point if they had some sort of filling to offset the pasty dry. The chocolate chips help a bit but still, I need a glass of something to wash my mouth out after trying these. I don’t think they are as dry as Calorie Mate though so plus points there. 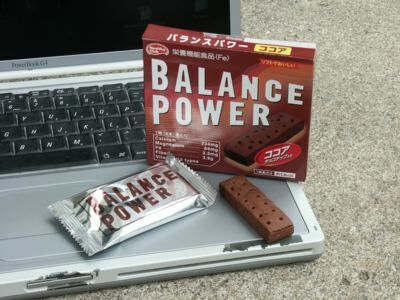 Balance Power cocoa gets at least a 3 pea base rating because they are decently tasty (and chocolate!). They have a good strong cocoa smell and taste but are a little pasty dry (versus dusty dry). I think they were better than Calorie Mate, at least the one we tried, but I’m not sure you would want to make these a part of your snackering. I’m not sure you would want to make these part of your morning breakfast either because frankly, Granola Bars are better. But Balance Powers cocoa are pretty good for a “healthy for you” thing. Sorta. Just ignore the fact that they have chocolate chips in them when you read that sentence. Rating of 3.5 wasabi peas out of a possible 5 wasabi peas.